Singapore’s Direct Schools Admission scheme has been revised and improved in order to give students from disadvantaged families a better chance at getting into the schools of their choice, on their own merit. The Ministry of Education has allowed all schools to increase their intake through the scheme. Additionally, schools have also discontinued the general ability test and high ability selection test. Previously, those tests were meant for students who applied for academic programmes under the DSA. And to top it off, students do not need to pay any fee for the applications, which are done through a centralised portal. Previously, some schools charged a fee ranging from S$20 to S$50 for each application because they deploy external resources — such as manpower — to conduct assessments. As a result of these revisions, more students secured places in secondary schools through the Direct School Admission exercise this year. This year, 3,000 students secured places, up from 2,500 last year. Critics have long pointed out that the scheme — introduced in 2004 — has deviated from its original objective of recognising and admitting students based on talents in areas such as sports and arts instead of just superior academic potential. Second Minister for Education Indranee Rajah admitted that students from well-off families are in a better position to take advantage of the Direct School Admission scheme, and that affluent parents have been gaming the system by sending their children to a shadow network of preparatory schools. Ms Indranee said that the latest refinements to the DSA scheme aim to “close the gap”. The National University of Singapore has a new policy of awarding 1.25 bonus admissions points for a university applicant’s first choice course. As a result, this year, 9 per cent more A-level applicants landed a place in a course they listed as their top choice and 3.2 per cent more A-level applicants accepted NUS’ offer of a place in the university. The bonus points applied only to courses where entry is based purely on converting a student’s grades into points, and not to courses such as medicine and law where students are assessed on a broader range of criteria including both hard and soft skills. NUS’ initiative is in line with the Ministry of Education’s move to expand aptitude-based admission into post-secondary institutions and universities. Starting next year, Singapore polytechnics will take into account the job experience of working adults who apply for full-time diploma courses. Currently, only part-time courses which give credit to work experience, while admission to full-time programmes is based only on academic results. Polytechnics will also pay more attention to the use of interviews and other methods of assessment to evaluate work experience and performance. From academic year 2020, working adults will also be able to apply to polytechnics via the Early Admissions Exercise. Working adults who do not meet the minimum entry requirements will be given an opportunity to show they have certain required skillsets for their chosen course through supplementary assessments. From the 1st of July this year, the National Institute of Education will appoint a new director, Professor Christine Goh. Prof Goh is currently the dean of graduate studies and professional learning at NIE. She will take over from Professor Tan Oon Seng, who will remain as an education professor at NIE. Prof Goh has worked at NIE for 24 years and is renowned as an expert in applied linguistics. She looks forward to leveraging on NIE’s strengths to lead the teaching profession both in Singapore and abroad. Students applying to the polytechnics via the early admissions route will still need to meet the academic criteria set by the Ministry of Education. For O-level students, this means having to satisfy the Ministry of Education requirement of attaining a net ELR2B2 aggregate score of 26 points or better for the O-level examinations. Different polytechnic courses may also have stricter requirements depending on the level of demand for those courses. Students are assessed and given conditional offers before the release of their examination results. They are assessed via interviews as well as successful participation is Co-Curricular Activities, work attachments, or a portfolio of works. Should students be successful in meeting the academic entry requirements for the polytechnic and the course they are applying to, their admissions will then be automatically confirmed. Students who are unsuccessful in their applications can reapply next year under the regular Joint Admissions Exercise (JAE) or the Joint Polytechnic Admissions Exercise (JPAE). A parcel containing 238 GCE ‘A’ Level Chemistry Paper 3 scripts from last year’s examinations held in Singapore were stolen from a courier van in Britain. The Singapore Examinations and Assessment Board (SEAB) said the affected students were given final grades based on their performance in other parts of the Chemistry exam as well as their cohort’s overall performance. The students also have the option to resit Paper 3. 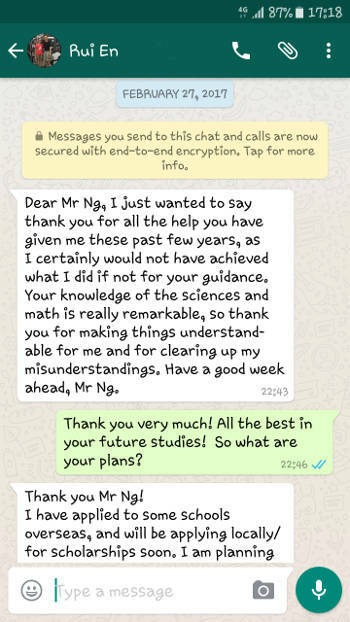 A Nanyang Junior College student who left one-third of his Chemistry Paper 3 blank is cheering the fact that his answer script was stolen and he ended up with an A. However, some students are unhappy with the overall grade they received and are considering resitting the paper. Chemistry Paper 3 carries 35 per cent of the marks for the subject. The junior college (JC) syllabus has undergone another revamp, commencing 2016. Changes affect a broad array of subjects ranging from mathematics and science to the humanities. For example, science students will now take their science practical assessment at the end of their two years in junior college, as opposed to once each year as per the current practice. The practical assessment will also cover a broader range of laboratory skills. For biology, two topics – infectious diseases and climate change – are added for their relevance to both global and local contexts, whilst certain topics, such as cell division and the control of gene expression, have been taken out of the syllabus. In mathematics, about 10 percent of the current syllabus has been removed and replaced with real-life applications, for example, sampling distributions and hypothesis testing in market research, and applying differential equations to population growth and decay. The aim of these changes is to get students to apply classroom knowledge to real-world contexts and strengthen students’ interest and mastery of the subjects.